Pets Costs > How Much Does an African Grey Parrot Cost? The African Grey Parrot is known to be one of the most intelligent birds available today. This bird earns this title since it can perform different sounds such as imitating the calls of other several species. Moreover, there is one African Gray Parrot breed, in particular, that possesses the ability to associate simple human words with meanings. There even was one that was able to have a vocabulary of over 950 words and could use these to create simple phrases. How much does an African Gray Parrot cost? On average, the African Gray Parrot can cost anywhere from $500 to $2,500, and this is going to depend on the parrot’s age, its appearance, abilities and who you’re purchasing it from. A younger bird will often be $700 or more, according to our research, while older parrots can commonly be found in the $500 to $850 range. Compared to other parrot species, the African Grey tends to be on the higher side because of its intelligence and ability to mimic so many vocabulary words. Baby birds are ideal for those are experienced with bird handling and know how to train the bird as it grows older, while an older bird may be more suitable for someone who doesn’t have a whole lot of experience. Refer to our chart below to see what some breeders in the United States were charging. This PetEducation.com article claims the average African Grey Parrot can cost $1,000 to $1,500. There are two places you can adopt this bird: either online or at a local pet store. Purchasing a bird in a local pet store is ideal since you’re able to closely examine the bird, see its color, size and other features. In contrast, purchasing online may bring some disadvantages since you’re not able to see the bird if you’re purchasing from someone who lives hundreds of miles away. However, if you don’t live near a pet store that doesn’t carry this bird, which is often pretty common, then you may have no choice but to purchase from an online breeder. A breeder, most of the time, will have the bird fully weaned and hand raised before they put it up for adoption; however, if this were not the case, then it should be noted in the description. 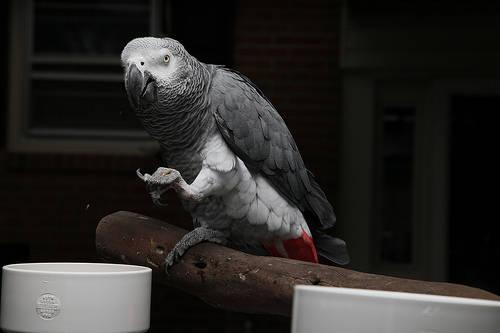 There are two popular African Grey Parrots: the Congo and Timneh. The Congo African Grey can grow 12 to 14 inches tall, whereas the Timneh African Grey can grow nine to 11 inches tall. Most of these birds will be predominately grey, with some white around the eyes and shorter red/black tail feathers. Both are native to West and Central Africa, and while in the wild, they live in flocks ranging from smaller families to groups larger than 100. In size, the Congo will often have a larger body build, wings and shoulders when compared to the Timneh, but most of the time, it can be hard to distinguish a difference from a distance. The bird is known to be relatively shy around strangers and can commonly bond to one person. Known to be extremely intelligent, it is considered to be the best bird to mimic words. A healthy African Grey parrot can live from 50 to 80 years. Its diet will consist of a 70 percent high-quality pellet diet, 25 percent vegetables (greens and corn) and 5 percent fruit. Plan on budgeting at least $30 to $45 per month for food alone. A cage is absolutely necessary, and the larger the cage is, the better it will be for your bird. This cage should be large, strong, sturdy and should have plenty of toys to keep it entertained. Whether it’s buying a second-hand cage or a brand new one, plan on spending at least $200 to $400 for a decent sized cage. Cleaners and disinfectants are also necessary to keep the living quarters clean. Toys and perches inside the cage are highly recommended to keep the bird entertained. These toys can help keep their brains stimulated and can allow them to use their natural instincts to forage for food throughout the day. When choosing a toy, make sure it’s sturdy since their beaks can turn a piece of wood into dust. Sexing, if you don’t know the gender, can be done and can be accomplished by an endoscopy or DNA sexing procedure. If the bird has to be shipped via an airline, this could be an additional $250 to $450, depending on the airline and distance traveled. Pet insurance and routine/surprised vet bills need to be factored in. If your bird were to sustain an injury, a simple surgery could cost hundreds of dollars if you didn’t have a health insurance policy. Since this bird needs attention constantly, you can’t leave it at home for days without any human interaction. Unless you’re able to find an experienced caregiver, then you should be prepared to carry around your parrot in a travel carrier you can take from one point to another. These carriers are also ideal if you’re looking to take your bird to a vet visit. These birds won’t start talking until they are one or two years old, but don’t be surprised if some take longer. In fact, according to FeatherMe.com, some birds will never talk through their lifetime. According to some, the Congo African Grey has been known to learn new words quicker than the Timneh. The parrot should be located away from direct sun, air conditioning and all heat sources. These birds need at least four to five hours of interaction per day to avoid becoming bored. If they don’t receive enough attention, they may acquire a mental illness if not stimulated; it can also lead to feather plucking, phobias, mutilation or aggression. If you don’t have the time to dedicate to this bird daily, then it may be best to think of another pet. According to The World of African Grey, these birds can be very noisy, often starting as early as the morning when they wake up since it’s programmed in their natural instincts. In the wild, they often make these noises in the morning to alert the flock and let them know their territory is safe. If you do live in an apartment or condo where the noise level should be kept at a minimum, then these noises could cause a problem. Consider looking for an owner looking to re-home their bird or even a rescue center in your area that specializes with these birds. Oftentimes, you can adopt a bird with all of the necessary supplies for a few hundred dollars. When doing so, though, make sure you’re buying from someone you trust and always make sure there’s some sort of guarantee if the bird were to have a health problem.